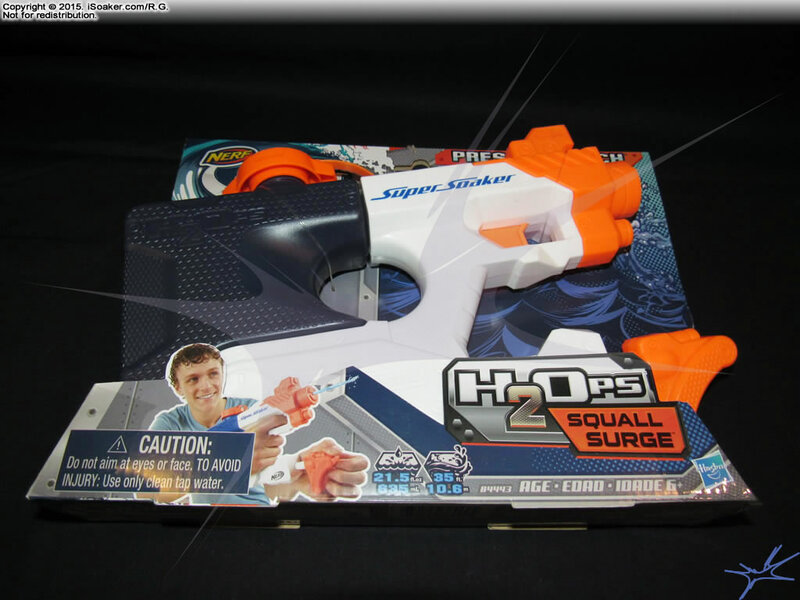 The Nerf Super Soaker H2Ops Squall Surge is an air-pressure based water blaster by Hasbro Inc. in 2016. At first glance, the Squall Surge looks like the smaller brother of the Nerf Super Soaker H2Ops Tornado Scream. However, unlike the Tornado Scream's dual nozzle system, the Squall Surge only has a single, fixed-forward nozzle. 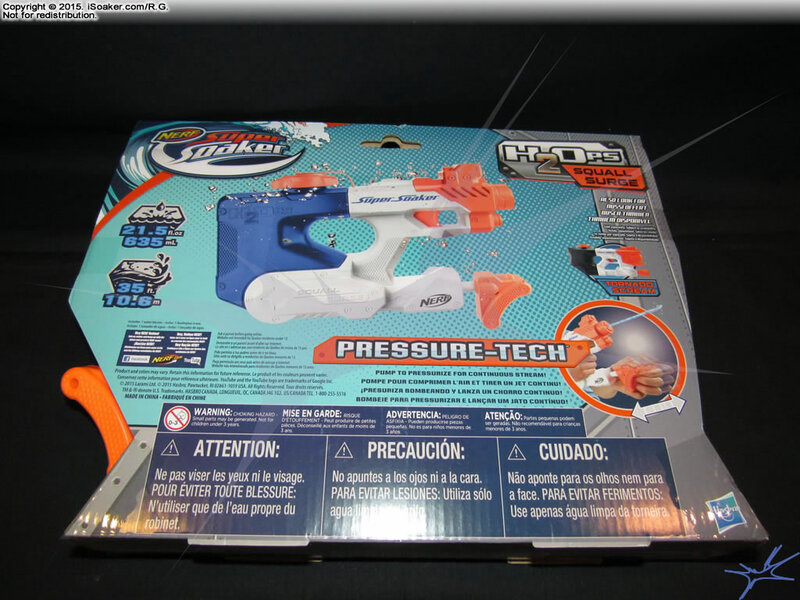 means to select the use of only one, thus both nozzles are activated at the pull of the trigger (of course, only when the water blaster has water and is adequately pressurized). 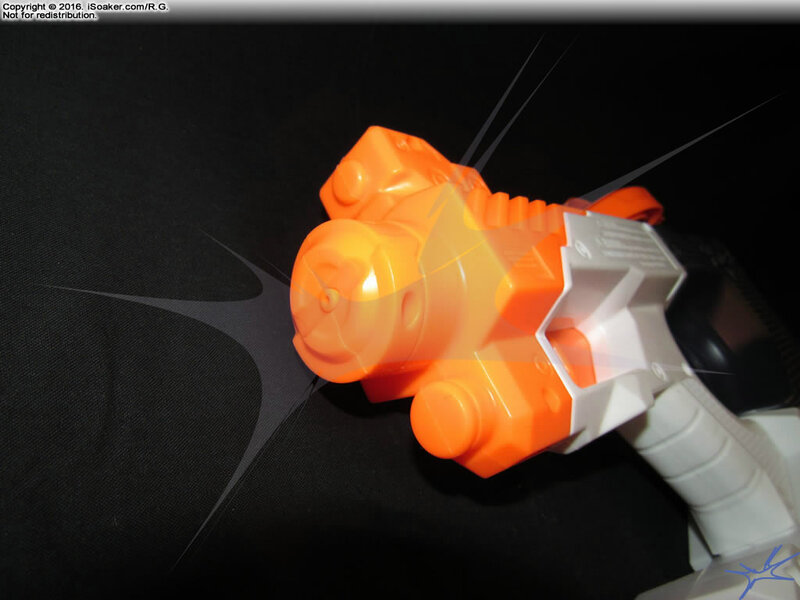 Like the Nerf Super Soaker H2Ops Tornado Scream, the lower back quarter of the Nerf Super Soaker H2OPs Squall Surge is hidden in its packaging, but most of its key features remain visible. The Squall Surge is mounted pointing upwards, making it appear a little larger than it actually is. 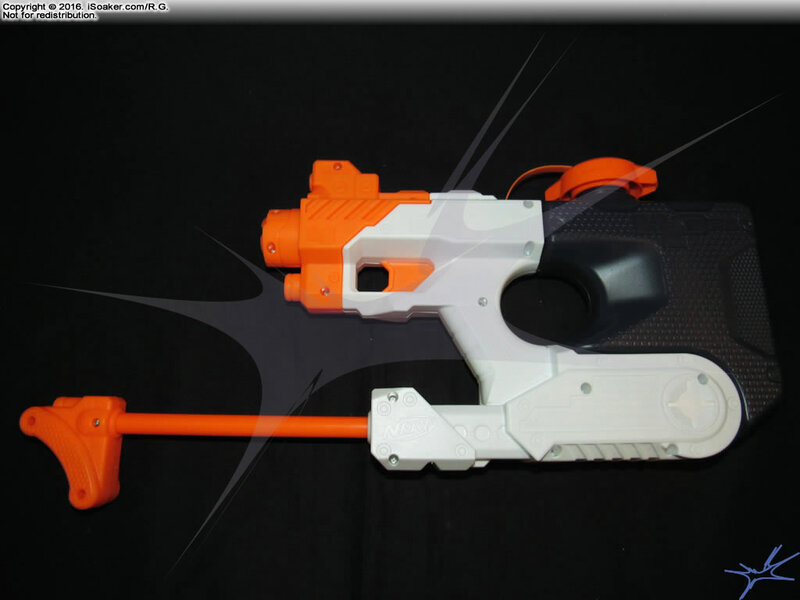 Also like the Nerf Super Soaker H2Ops Tornado Scream, the Squall Surge's colour scheme makes it easy to see that the reservoir occupies the back half of the water blaster, the trigger/grip/body area and pump makes up most of the bottom and front with only a short nozzle region capping off the frontt. 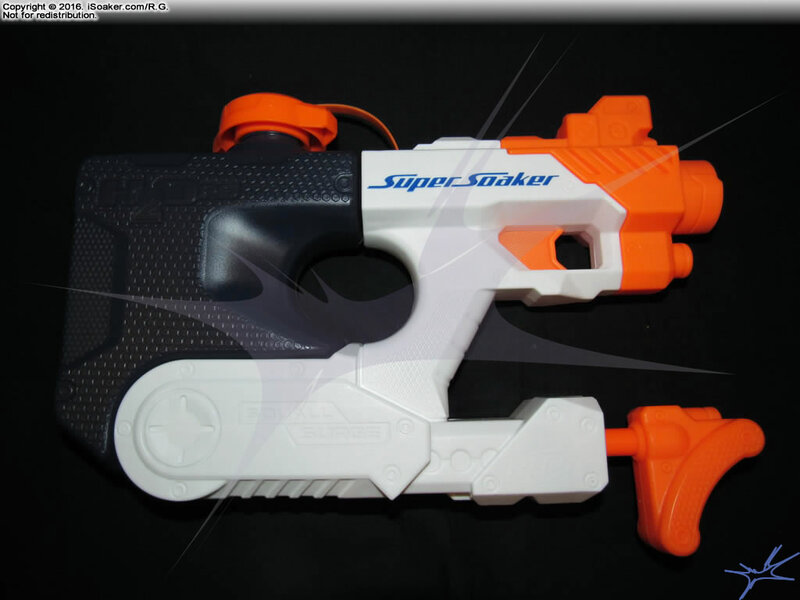 The Squall Surge's pump juts out and is free to test, though the actual water blaster is difficult to have a full handle on due to the fact that it is fairly tightly packaged, preventing one's fingers from easily wrapping completely around the grip region. The pack panel of the box shows off a picture of the unboxed Squall Surge. Capacity and range statistics are noted on the left (reservoir is listed to hold 21.5oz/635mL while the range is listed as 35'/10.6m). Our reservoir capacity measurement was a little lower that what is reported. The box also clearly notes that the Squall Surge uses "Pressure Tech" and the pump grip remains visible from the back thanks to a partial cutout region. This makes it easier to test the feel of the pump while leaving the water blaster still boxed. Free from its packaging, the Nerf Super Soaker H2Ops Squall Surge's design comes into full view. Again, like the Tornado Scream, the Squall Surge's name lavel is on its right side, leaving it visible for others to read when in use by a right-handed user. The rather forward positioning and slender styling of the trigger/grip area emphasizes the taller-looking back-side reservoir area. Even visually, this water blaster appears imbalanced; considering the added weight water would contribute, this would only serve to make the imbalance even worse. The pump grip cannot be pushed flush against the pump shaft region and also extends below the baseline of the rest of the blaster. While it looks interesting from a purely aesthetic view, this extension also means that the Squall Surge cannot sit flat on its bottom without turning the pump grip. What this also means is that, if dropped, the bottom point of the pump grip is more likely going to hit the ground first, increasing the odds of breaking it. As noted above, unlike the Tornado Scream, the Squall Surge features only a single nozzle on its front. Powered by its pressurized reservoir, the Squall Surge can easily produce respectable continuous streams with good power for its size. One by-product of the Squall Surge being back-side-heavy is that one naturally ends up pointing the nozzle upwards, increasing stream range and reducing the chance of mist-shots. Of course, when targeting closer opponents, one must fight gravity a little more than expected to point the nozzle level. As such, this water blaster may cause increased wrist strain when used for prolonged periods of time. The Squall Surge's reservoir occupies the dark-blue coloured part. Since the Squall Surge uses air pressure to power its streams, its optimal fill level is between 2/3 and 3/4 full. Thus, since the capacity being reported is for a completely filled reservoir, operationally, one will have 1/4 or 1/3 less water available for actual use. As can be seen from the pictures, the reservoir, itself, is made from rather opaque plastic. As such, knowing when the reservoir is optimally filled is not easy. For testing purposes, after measuring the full volume, the reservoir was emptied and 2/3 full was measured in a measuring cup, then loaded. If attempting to fill anew, it is unclear how much space one should leave. Then again, filling the reservoir a little too much will result in sub-optimal firing times whereas filling the reservoir less will mean more pumps would be required to get to optimal operating pressure. Between these two options, filling a little more is better than a little less. The Squall Surge features a forward mounted pump. The pump grip's styling is reminiscent of the Super Soaker XP 310's pump grip, albeit a smaller one. 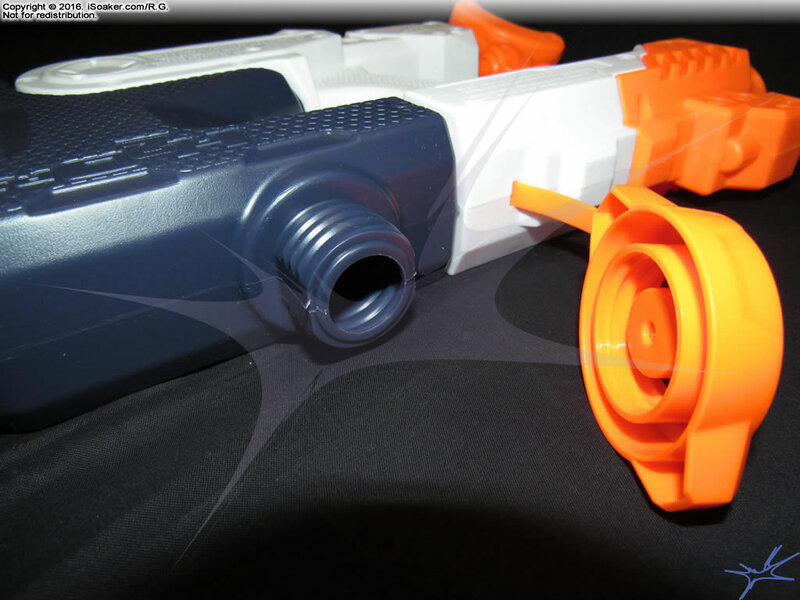 As can be seen by the picture, the Squall Surge's pump can extend rather far out of the front of the blaster. The triangular shape of the pump grip offers a natural position for pushing the pump out, but its curved front and small size makes the pump grip not as natural when pulling the pump back in. Though functional, the pump grip could have been designed better for use instead of looks. As noted earlier, the Squall Surge is rear-heavy when empty and even more so when filled. The thinner nature of the trigger/grip area to the body also makes the blaster feel a little odd when holding. Also, the extension of the pump shaft at the base of the blaster creates a virtual floor to the trigger/grip area, limiting the space for the User's fingers; as such, some may find the Squall Surge limiting for those with larger hands. 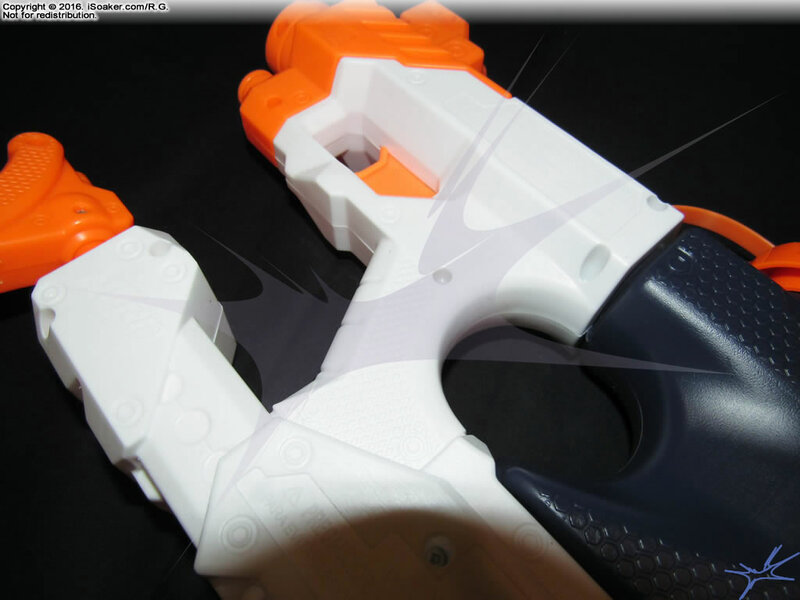 Plastic quality and overall water blaster feels well-built and is likely to be able to handle rugged play, but as noted above, the lower extension of the pump grip does introduce a weak-point while offering no real functional benefit to the user. The Nerf Super Soaker H2Ops Squall Surge is a light, air-pressure-based water blaster that gives us mixed feelings. While it is nice to see Hasbro Inc. producing pressurized water blasters again, both the Squall Surge and Tornado Scream feel lacking compared to the air pressure Super Soakers of yesteryear. While the Squall Surge is able to produce decent streams, it's suboptimal balance and awkward pump grip shape put dampeners on its design. Its slim profile limits is capacity while its opaque reservoir makes it difficult to fill optimally. While useful for smaller skirmishes, the Squall Surge user should remains wary of users of any similarly-sized or larger air pressure water blasters and avoid going head-on against most elastic-pressure chamber users. Back-heavy when empty worsened when full, semi-cramped trigger-grip area, awkwardly shaped pump grip to hold and use.